Yesterday, I helped my friends bottle their third home brew. All the hard work was done last week when they spent an entire day preparing the brew. 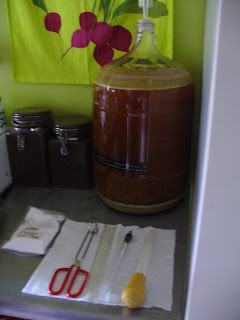 I told them to break me into the process slowly, so this time I helped bottle. Next time I want to check out the beginning of the process. Here's the brew. We siphoned this into a larger tub using a tube, that way the nasty stuff you see on the top and bottom (which we equated to sludge at the bottom of a lake) wouldn't go into the bottles. My friends have learned a lot of lessons since brewing their first batch of beer. 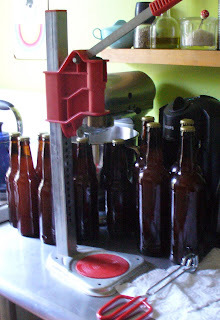 Don't fill the bottles all the way to the top, for example, otherwise the beer will be flat. Home brew! In a week, 42 beers will be ready. My friends are hosting a beer and ice cream party to celebrate their third successful brew.